Wild finches get their nutrition mostly from seeds but they often rely on vegetables and fruits along with insects because seeds are not easily available in all seasons. 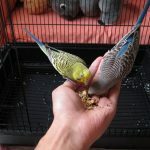 But when it comes to pet finches, it is your lookout to provide a balanced diet, and discussing a professional vet for this purpose is recommended. Like most birds, pet finches should get food worth a quarter to half of its body weight, daily. 2. If you feed your finches with seed mixes meant for other birds, like parakeets, it might not provide enough nutrient. So offer more fresh foods to balance the diet. However, each bird has different preferences when it comes to food, for example, some can like seeds over vegetables while some love fruits. As a responsible and attentive owner, you need to observe what your bird prefers. At the same time, you should never ignore what it really needs in order to maintain good health. Besides giving fresh foods, use clean plates and bowls for maintaining hygiene. Egg laying females need calcium enriched foods and supplements along with their normal diet, while newborns and juveniles prefer seeds most of the time. As they grow you can rely on a combination of home cooked, pelleted and mineral supplements. You can also try the commercially available foods meant for baby finches. Make sure to consult your vet regarding the proper diet for breeding and baby birds. It is recommended to gradually switch to pellets as the primary diet, as these are manufactured according to the specific needs of different birds. You can easily get commercially available pellets meant for finches, but make sure to talk with a vet, and check the ingredients before settling for any brand. There are different combinations available for baby finches, adults, and pregnant birds. Colorful pellets with fresh fruity flavor encourage your birds to try it. Manufactured by a veterinary-owned company to meet all the nutrient needs of your bird. Contains real honey and eggs to add a nice variety to your bird’s diet. Provide one spoon of pellets per day, mixed with seeds. Start a pelleted or formulated diet after the finches grow past the early juvenile stage. It might be tricky to get your finches to eat the pellets at first, though it is usually a little easier for hand raised young birds. Keep offering it with their regular food, and they will eventually try it. Food Supplements: Do Finches Need Them? If the diet of a pet finch contains 70-75% of pellets, then chances are no supplements are needed. But for birds eating only fresh foods like fruits and seed, supplements are required to ensure vitamin, mineral and amino acid intake. It is important to make sure that your bird is getting sufficient amounts to eat. If it appears to look for more food, maybe in the empty food bowl or litter tray, then maybe you are underfeeding it. Try increasing the amount of food offered, and keep looking for reappearance of similar behavior. You may need to talk to an expert if your bird still seems underfed.